Teslarati has learned that the total value of all building permits issued for the Tesla Gigafactory now stands at $386 million, or $63 million more than the last time Jack Cookson of BuildZoom checked in with the local building inspector’s office. Perhaps the most surprising bit of information is that a permit was issued recently for a “temporary tent structure” for a “special event” costing $300,000 likely to be used for the Gigafactory Grand Opening party. We recently spotted the massive tent, the size of two NBA basketball courts, in newly captured aerial photos of the Gigafactory. “Section F Expansion” assumed to be one of the two new additions at the battery plant claimed the largest single permit by dollar at $22 million. There was also a permit issued for “seismic anchoring” totaling $9.4 million. 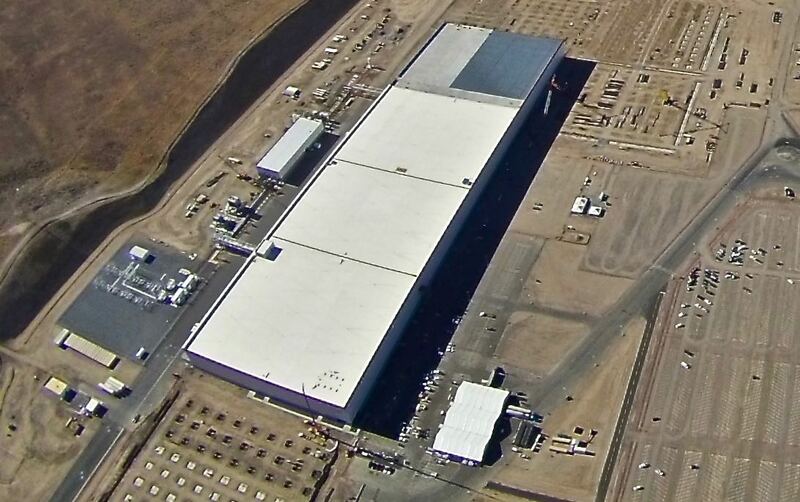 Presumably, seismic anchoring is part of the foundation work for Section F.
We have to keep reminding ourselves that the current building represents less than 15% of the total size of the Gigafactory when finished. All the exterior walls except the main wall in front are temporary, designed to be broken through as new sections are added. We’ve provided all of the notable permits filed for the Tesla Gigafactory via BuildZoom. The total value of work since we last checked in has been 63 million dollars, bringing the total for the entire project to 386 million dollars. First, and perhaps most relevant to the opening, is on July 18th Tesla filed a permit for a “temporary tent structure” for a “special event”. While I can’t be sure, the $300,000 tent might be for the grand opening. The biggest single permit was a 22 million dollar permit for the “Section F Expansion”. The first permits related to Panasonic work were issued to Tesla on June 28th and July 13th. The two permits are for the installation of Panasonic tools. The two permits were both designated to section B/C and totaled 16.2 million dollars. There was also 14.4 million dollars worth of addenda to sections D/E. There was 9.4 million dollars in seismic anchoring issued in permits. There was 350,000 dollars across two permits for contractor lunch tents, perhaps related to the increase in construction workers they recently took on. There was also a parking expansion and while I don’t know what a “Nitrogen Yard” is there was a permit for one. As Panasonic executive vice president Yoshihiko Yamada explained at the Tuesday news conference, his company is fully committed to its partnership with Tesla. Panasonic took out two building permits of its own recently, both covering the installation of its proprietary machines and tools in sections B and C. The two permits together total $16.2 million. The local building inspector’s office also recorded permits totaling $14.4 million for additional work in Sections D and E and $9.4 million in other miscellaneous work recently. They include an expansion to the parking area. 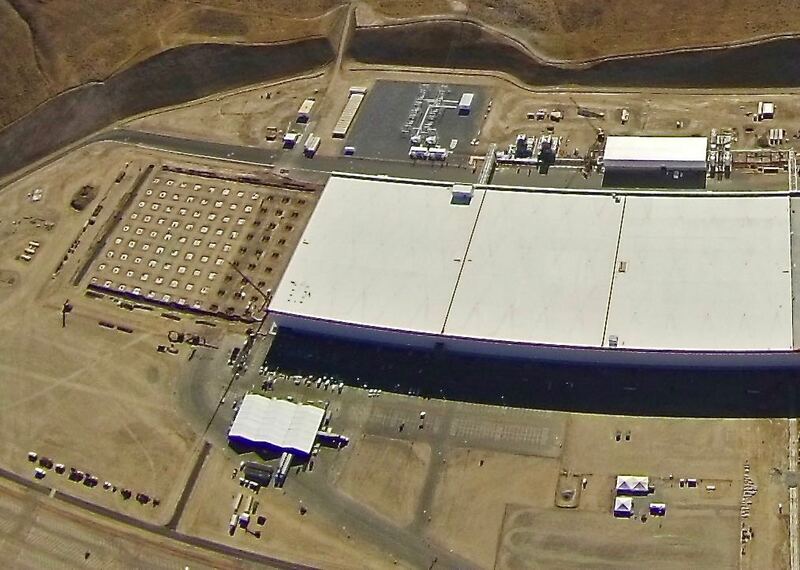 Tesla made sure there was parking for 2,000 cars in time for the grand opening this weekend. The pace of construction at the Gigafactory is accelerating. Workers are now busy seven days a week, working two shifts a day. In order to accommodate their needs, Tesla has applied for permits for two contractor lunch tents worth a total of $350,000. Finally, Jack Cookson reports a permit application for a “Nitrogen Yard.” Exactly what that is or what role it will play in the production process remains unclear.